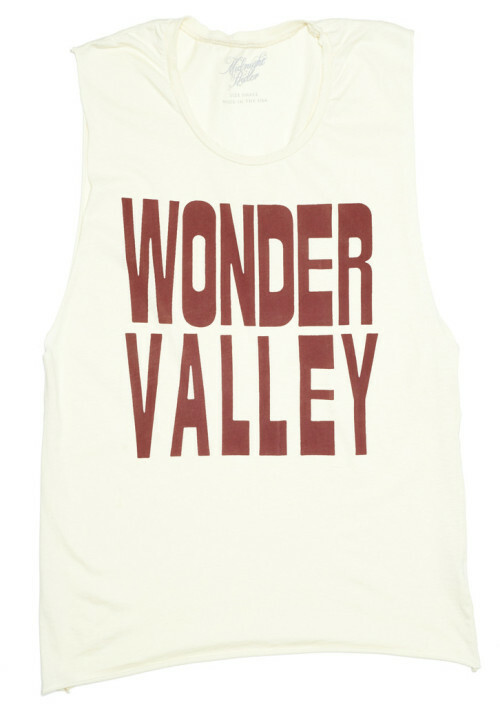 Wonder Valley graphic by Jay Carroll printed on a vintage washed women’s muscle tee. Made in the USA , By Midnight Rider. Jay Carroll is a photographer, writer, designer and cultural enthusiast whose travels, special projects and design collaborations can be found at @onetrippass. A recent trek westward through these three locations inspired the series. New Mexico as home to the most sacred places in America and a great source of regeneration, Winslow where he recently saw Jackson Browne play his song Take it Easy (during his first time back since writing the hit) to a crowd of 200 in the backyard of the La Posada Hotel, and Wonder Valley as the birthplace and spiritual hub for all things One Trip Pass.